In a press conference yesterday, former GOP primary presidential candidate and retired pediatric neurosurgeon Dr. Ben Carson endorsed Donald Trump for president. In the September GOP debate, Dr. Carson was asked “Should Trump stop saying that vaccines are linked to autism?” Dr. Carson said that doctors are probably giving way too many vaccinations over too short a period of time. Donald Trump stood by his position that spacing out vaccinations would diminish autism rates. With our support, I am sure that we can help restore America’s values and faith. These election year bits are interesting. As for the Age of Autism, I can plainly see why you are no longer associated with such a distorted bunch of political partisans. They have reached total whacked out with “On The Passing Of Nancy Reagan”. Not only does some person named Dara Berger falsely claim that Dutch was incapacitated by Alzheimer’s Diseases (He was regularly given fitness physicals), it also incredibly attempts to place responsibility for the disastrous Vaccine Injury Compensation Act on the recently departed former first lady, apparently as some sort of defacto trustee – kind of like Woodrow Wilson’s wife was after he suffered a severely debilitating stroke while in office. There is zero evidence which can prove that, while in the oval office, Reagan was incapacitated by Alzheimer’s to the point he relied upon Nancy Reagan in any way greater than he already had as his co-equal wife and business partner throughout his ENTIRE political career. It is utter nonsense for the Age of Autism to run such a masquerading article clearly attempting to alleviate former first lady Hillary Clinton from her direct responsibility for upping the childhood vaccine program nationally to match the Arkansas Every Child By Two program that she and Betty Bumpers co-founded. Autism rates did NOT begin to soar as a result of the Vaccine Injury Compensation Act. They began to rise as a result of Hillarycare. While the result of Ms. Clinton’s medical sector invention was rejected, the only portion of Hillarycare to receive reception from Congress was steep modifications the Childhood Vaccine Program resulting in a federal Every Child By Two plan where the number of vaccines and dosesof vaccines multiplied to unheard of quantities. Ms. Clinton’s Every Child By Two vaccine program set the table for astronomical increases in Autism Spectrum Disorder due to the fact that Hillarycare employed vaccines laced with ethyl-mercury, perhaps the most volatile form of mercury compounds. Preliminary research indicates that vaccine mercury decomposes far faster than tuna mercury, and deposits far more inorganic, mercuric mercury in the brain. Inorganic, mercuric mercury is the form which causes brain neuron degeneration. The Age of Autism is WELL-AWARE that Hillary Clinton for all practical reason is the mother of all Autism. To cast a giant shadow upon former first lady, Nancy Reagan, is indicative of the pure evil those claiming to represent a generation of vaccine-injured children are capable of. Perhaps, Ms. Berger would like to take responsibility on a personal level to her good friend and Age of Autism co-contributor, Babara Loe Fisher? Barbara Loe Fisher is a co-founder of the Vaccine Injury Compensation Program. She formulated a pressure group dubiously called Parents Dissatisfied Together (DPT) in order to publicly humiliate the Reagan White House for NOT signing the Vaccine Injury Compensation Act bill. Yes, America, as a true conservative, Ronald Reagan did NOT want American’s liberties erased by an act of Congress forcefully being crammed down his neck by the likes of pro-vaccine lobbyists such as Barbara Loe Fisher. WASHINGTON (AP) -President Reagan is under heavy pressure from doctors, drug makers and parents to sign legislation that would bypass the courts and set up a federal fund for children injured by vaccinations. Approved by Congress just before adjournment, the measure results from a nationwide campaign in 1978 that ushered in strict enforcement of state laws requiring immunization It also resulted in increased injuries to children. Fifty to 75 youngsters each year out of millions vaccinated suffer permanent neurological damage as a result of vaccines, mainly the variety aimed at pertussis, or whooping cough, the American Academy of Pediatrics says. The Reagan administration has opposed proposals similar to the current one. But Justice Department spokesman Pat Korten said late Monday it is still deciding what recommendation to make to the president. The measure would cost $67 million annually, and only part of that would be paid through a surcharge of 10 cents to $1.50 on vaccine doses. In opposing earlier versions of the plan, the administration said the surcharge represented a new tax and therefore should be defeated. It also expressed fear that the proposal would bring makers of lawn mowers, hair driers and others involved in product liability legislation to Washington in quest of a victim compensation fund. Doctor groups, pharmaceutical houses and parents supporting the legislation were planning a news conference today as they sought to build pressure on the administration. Barbara Loe Fisher, head of Parents Dissatisfied Together, a group formed to push for the measure, said a 10-year-old Florida youngster, Stacey Scholl, who was injured by a 1 vaccination, will appeal to President Reagan to sign the bill. Parents also have mounted letter writing and telegram campaigns to urge Reagan to sign the bill co-sponsored in the Senate by Sens. Orrin Hatch, R-Utah, and Sen’ Edward M. Kennedy, D-Mass. : “Parents are getting-desperate,” Mrs. Fisher said. “They want to take care of their kids’ and they’re worried about what’s going to happen after they die, because, basically, there’s no way’ financially to get them into an institution.” The measure would affect cases arising from immunization with DPT vaccine for diphtheria, pertussis and tetanustsis as well as polio vaccine and MMR vaccine for measles, mumps and rubella. They, are the vaccines required in most states for entry into school. According to Jackie Noyes, director of government relations for the American Academy of Pediatrics, the pertussis vaccine causes an adverse reaction once in each 310,000 doses. Polio vaccine results in damage in one in 5 million cases – measles, mumps in rubella vaccine even less frequently. Under the bill, a no-fault system would be established under jurisdiction of federal courts. They intend to keep the bill in the public eye so that President Reagan can not use a pocket veto – in which the bill would die for lack of his signature – without appearing indifferent to the plight of preschool children who have been severely injured from routine childhood vaccinations. The legislation has the support of the pharmaceutical industry, parents of injured children and the medical profession. Barbara Loe Fisher, a spokeswoman for Parents Dissatisfied Together, a group formed to push for the measure, said that the “parents are getting desperate” for financial aid to help care for their youngsters. Parents also have mounted letter writing and telegram campaigns to urge Mr. Reagan to sign the bill. That is truly unbelievable. Nancy Reagan caused the autism epidemic? Wow. I find that incredible. It’s hard to say if the expansion of the vaccine schedule was a direct result of the compensation act, but it’s hard to argue that the law didn’t enable it. Another thing left out is that the real cheerleader for the vaccine compensation bill is the now-thankfully retired congressman and staunch liberal Democrat Henry Waxman. However, I can see why it may seem appealing at the time to parents like Fisher because it automatically granted compensation to children like theirs who were granted automatic compensation under a specified Table of Injuries. The problem is that by making the government liable, it gives a huge incentive for the CDC to conceal any other possible side-effects associated with vaccines. As your article also shows, the problem hardly began with the creation of VICP. An aggressive national immunization campaign in 1978 led to the epidemic of vaccine injuries to children like Fisher’s in the first place. Only two years before that was the first H1N1 scare resulting in numerous vaccine injuries and death from a vaccine whose side-effects were kept from the public by the federal government. In fact, these issues highlight the source of the problem – the existence of the federal vaccine program. That was signed into existence by President Kennedy in 1962 with the passing of the Vaccination Assistance Act. That created the program within the CDC that knows vaccines cause autism and had been covering that up for almost two decades now. So if you wanna talk about doing away with NVICP, you should also do away with VAA since the former just exists to maintain the latter. In reality, neither should exist and routine vaccine recommendations should be left entirely to the doctors – not the government. So while the problem lies on both sides of the isle, both the creation and continuation of the problem primarily lies with the Dems in contrast to what Dana Berger implies. However, I still have to give her some credit for saying she will vote for Donald Trump. Make America Great Again! I think you have taken a lot of what goes on at Age of Autism out of context. I have had my differences with them mainly on the majority of their misguided support of Donald Trump whom they think is going to change the world of vaccines but your characterization of them is ridiculous. However you are entitled to your opinion and that’s all it is—your opinion. I saw the hit-piece on Nancy Reagan – it was ridiculous. Also, who said AoA supports Trump? Olmsy said so himself that AoA doesn’t endorse anybody. The Republican frontrunner is the only person who is on the right side of the issue and the first candidate ever to bring it out in a presidential debate and you don’t endorse him? Seriously? I was around when RR was in office and I remember reports of Nancy Reagan and the media articles about her being another Joan Crawford-this was after RR was in office. Suddenly the articles stopped. The confirmation of her abuse and her influence over RR while he was in office were confirmed by Patti Davis after RR left Washington. Also, one of the sons, who is a liberal, Ron, spoke about his father’s mental state deteriorating the third year he was in office his first term. Now, did the White House physician confirm or report that RR was having issue-of course not. Be pragmatic, if he wanted to stay White House physician-doctor to the President of the US, he never will confirm it. That’s that doctors’ legacy. Now the other son said RR was fine but he lives off of the family legacy. Just being real. So your perspective is the articles were hit pieces and you have the right to characterize them as you want but for people who actually lived through that time frame, the flavors are different. You were how old when RR was in office and Nancy was doing her famous “Just Say No” campaign? Nancy personified hypocrisy at its best because it had become common knowledge that she was a pill popper. Hardly surprising, I had known AoA sold out for years. The notion that Trump is unstable is a pack of lies. That came from ThinkProgress – a left-wing garbage site that lies about both vaccines and Trump. Please provide information that supports that. Even so, we, those who oppose vaccine mandates tell online trolls everyday to discredit the information not the website that it came from. Even the Daily Mail occasionally provides accurate information. The mail is a tabloid newspaper, it is notoriously unreliable but it is still a news source. TP is like HuffPo, just a PAC in blog form. However, you have not disproven the information. Just because you think the website that posted the information is garbage and it may well be, but that’s the website-you haven’t proven the information isn’t correct. This is a common political tactic. You offer your opponent a job in return for their supports. Just because the information comes from a source you don’t like, doesn’t mean it’s not true. Don’t we say that to trolls all the time in vaccine debates? I shouldn’t have to prove the information is incorrect, you have to prove it’s correct. You got the info from an anti-Trump PAC that operates as a blog and took a story from Newsmax that merely said Dr. Carson would play a role in Trump’s presidency and spun it to look like Dr. Carson was bribed into endorsing Trump with a cabinet position. This is typical of the lying left, the same lying left that yanked Kennedy’s article from Salon.com thereby covering up proof that CDC lied that mercury in vaccines didn’t cause autism. Where does Mr Trump stand on mandated vaccinations? Trump Favor Vaccines! In his own words. Alter vaccination schedules to avoid autism: Trump says he favors vaccines, but giving children smaller doses over a longer period of time. He has blamed vaccines for causing autism in children. In case you haven’t noticed, AI does not take a position on the philosophy of vaccination. Indeed, it is not the philosophy of vaccination that is not the issue here however much liars like Paul Offit claim that. One of the commenters below Rappoport’s article re Trump posted two videos re Trump. I viewed both, but the second one really caught my ear. While I am not at all saying I would endorse Trump, on the other hand, I don’t think he’s the egomaniac he’s being portrayed as being, either. If you really believe that Hillary Clinton had nothing to do with the founding of Every Child By Two there’s little hope of convincing you she did. I think there’s two Ls in Hillary. WHERE does it say anything about Clinton being a co-founder of this organization? 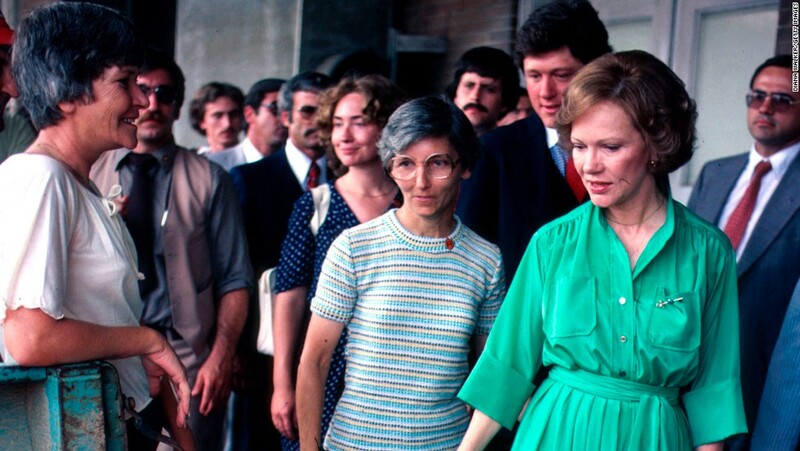 The fact may very well be that Clinton had some sort of participation in this effort, but clearly this was the baby of Rosalynn Carter (and her husband). Further, I don’t care what whit how you spell Hilary or Hillary. Does it matter? I remember when Every Child By Two was formed/organized and I clearly remember that it was Carter’s name mentioned as being the Founder (or co-founder, whichever the case may be) of that organization. I never once heard the name HILLARY Clinton as being a part of that organization. So again – Hillary may have had some participation in that group and may have actually supported that group, but it was definitely Rosalynn Carter who formed that organization under the mental health care auspices she was at that time involved with.